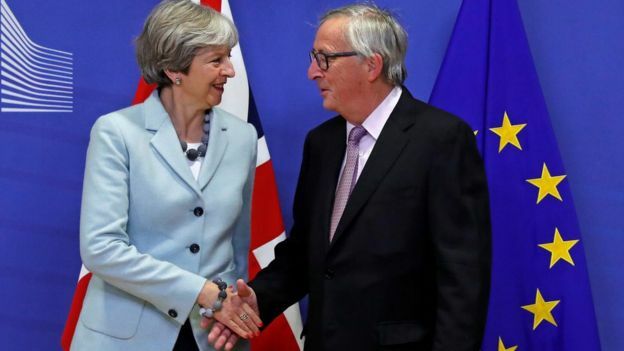 The chance of the UK and the EU agreeing a Brexit deal has grown in the last few days, the head of the European Commission has said. Speaking to the Austrian press, Jean-Claude Juncker said that while he was not sure an agreement could be reached by October, it could be by November. But there is still no agreement on some issues, including how to avoid new checks on the Irish border. He also reiterated his position that a no-deal scenario “would not be good” for either the UK or the EU. EU officials gave an upbeat assessment of progress in the negotiations on Friday evening and reported a better atmosphere in talks over the Irish border. That prompted sterling to rise against the Euro and the US dollar. The BBC’s Brussels correspondent Adam Fleming said officials still “seem to be pushing for the whole withdrawal agreement to basically be done” by the EU summit on 17 October. “Although, if we have learned anything from Brexit it’s that the timetable is incredibly flexible, to use diplomatic language,” he told BBC Radio 4’s Today programme. The positive comments came as the Guardian reported senior Conservatives had been in private contact with a number of Labour MPs to persuade them to back Theresa May’s Brexit deal. It comes weeks after the head of the European Council Donald Tusk said Theresa May’s Brexit plans were unworkable. But last month, the EU’s chief negotiator Michel Barnier said that if both sides were “realistic” there could be an agreement by November, when a special one-off summit has been arranged. It could appear alongside the EU’s latest contingency plans for a no-deal scenario, which will be released next week. Speaking on BBC Radio 4’s Any Questions, Sir Alan Duncan was also optimistic about the prospects of a deal. “We are in the art of the possible here, and from what I see in government, I think that we will get a deal, be it in October or November at the two consecutive summits,” he said.